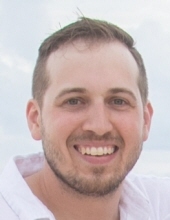 Jesse “Bil” Hettmann, 31, Green Bay, was tragically taken from us on Friday, January 11, 2019 while helping a stranded motorist. He was born on February 5, 1987 in West De Pere to Darrel and Linda (Bougie) Hettmann. Jesse was a graduate of West De Pere High School class of 2005. On May 24, 2013 Jesse married the love of his life Danielle Schumacher. They built a beautiful life together with their daughters Cordelia and Mirabelle. Jesse loved being a dad and husband. Jesse had the heart of a superhero. He proudly drove tow trucks for 9 years and was part of the Glenn’s Towing family. He enjoyed bringing aid and humor to people stuck in terrible situations. He was an Eagle Scout and kept his card with him as a badge of honor. His kindness touched so many lives. Jesse is survived by his wife Danielle; daughters Cordelia (3) and Mirabelle (4 months); his parents Darrel and Linda (Bougie) Hettmann; siblings Jenny (Josh) Yuhasey and Matthew (Sara) Hettmann; mother-in-law Linda Haskins; brother-in-law Jeremy Schumacher; nieces Joyce and Jayne, grandparents Joyce Bougie and Kenneth Hettmann. Jesse is further survived by numerous aunts, uncles, cousins and friends. He was preceded in death by his Grandmother Agnes Hettmann and Grandfather Marvin Bougie. Friends may gather to celebrate his life at Our Lady of Lourdes Catholic Church, De Pere after 2:30 p.m. on Friday January 18, 2019. The Mass of Christian Burial will be celebrated at 6:30 p.m. with Fr. Brad VandenBranden O. Praem. officiating. The family would like to thank all those who assisted in any way on Friday afternoon. In lieu of flowers a memorial fund for his family will be established. To send flowers or a remembrance gift to the family of Jesse "Bil" Hettmann, please visit our Tribute Store. Procession of Glenn's Towing trucks and hearse from Glenn's Towing to Our Lady of Lourdes at 1:15PM. "Email Address" would like to share the life celebration of Jesse "Bil" Hettmann. Click on the "link" to go to share a favorite memory or leave a condolence message for the family.